With Valentine in just a few days, I needed to create some a card for my Love! 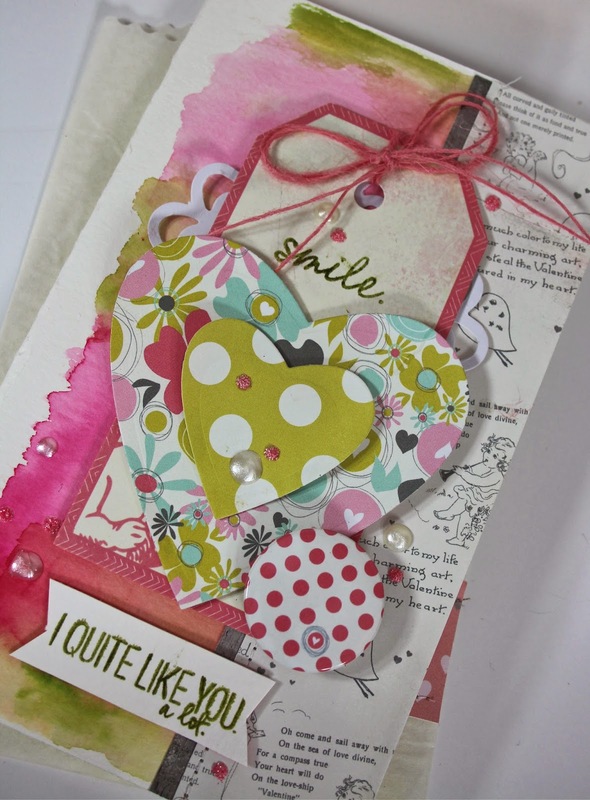 Mary-Ann here today, breaking out some Fancy Pants paper, watercolors, die cuts, stamps, twine, pearl pen and stickles! For the base of my card, I used watercolor paper. I cut it to the size I wanted to fit within my Fancy Pants Glassine Bag. Since I am not mailing this gem, I can do what I want! I dug out my watercolors and painted to my liking. I chose only two colors. You can use any type of watercolor, gelato, or colored pencils that you have on hand. I layered my papers, backed my tag with foam and cut my dies. I just love Wplus9 Heart Stackers. Once my papers were layered, I added Ice White pearl drops from my pearl pen and Cotton Candy Stickles. I then chose the colors for my envelope staying with the same color combo as my card. This is simple and quick. I hope you did out your stash and create a thoughtful card for the loves in your life. Your card is a real beauty and I love the non traditional 'envelope' you have used too. I quite like all of the layers on this Fabulous card and the band you made for the bag! oh wow Mary Ann, this is one treasure of a card and bag. Absolutely gorgeous and all those awesome layers. LOVE!!!!! So very beautiful Mary Ann...not only the queen of layouts but cards too, woohoo! How gorgeous, Mary Ann! I just love the beautiful colors!